Sheet metal fabrication dates back centuries, to the days when soldiers battled in iron body armor. Cleveland's sheet metal companies missed out on the days of knights in shining armor. Instead, they have evolved from designing and fabricating copper roofs to creating complex duct work that maintains livable temperatures in today's homes and office buildings. To maintain quality and safety standards, the industry began to form organizations to develop product and workmanship standards. Today, the watchdog organization is the Cleveland chapter of the Sheet Metal and Air Conditioning Contractors' National Association. It was created in 1961 by the merger of the Sheet Metal Employers Association and the Cuyahoga County Sheet Metal Contractors Association. The Cuyahoga County group came together in 1934 when a group of small sheet metal contractors recognized the need for an organization that would help educate them on planning and installing the then-new residential air-conditioning systems. The group also initiated a certification and inspection program that would give builders a guarantee that heating-system work was carried out according to industry standards. As A.J. Tuscany, the group's secretary, stated in 1938, 'The sheet metal industry had come to a very low point. 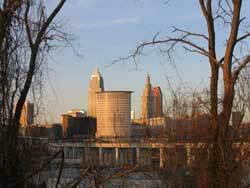 There is nothing in the building code of Cleveland covering warm air heating or winter air-conditioning installations. We have formulated a code to be followed in these installations." The group aligned itself with the Sheet Metal Contractors National Association, founded in 1943, and tied together contractors from across the country. In the years during World War II and immediately after, the national association grappled with issues such as the availability of metal products because of their use in war material. After the 1961 merger of the two local groups, the new organization created a trust fund to create minimum standards for materials and craftsmanship for the industry, responding to a wave of shoddy workmanship and sub-standard materials that had crept into the industry during recessionary times. The new standards assisted engineers and architects and were incorporated in many municipal building codes in Ohio. Training skilled workers has always been a commitment of the industry. It has created apprenticeship programs in cooperation with the sheet metal workers' unions that have trained the finest workers since 1927. Today's Sheet Metal Apprenticeship Program is implemented by the independent Joint Apprenticeship & Training Committee of Cleveland. It is a five-year curriculum including classroom instruction and a minimum of 8,000 hours of on-the-job training. Apprentice graduates are prepared. With additional class-room work they can earn an associate degree. When close to 40 apprentices graduate each year, their pride is passed to another generation. They can perform precision computer-aided design. The program also utilizes instruction to teach computer-assisted drafting, pattern development, pattern layout, welding and safety. Recent sheet metal apprenticeship program graduates are in very high demand. Workers can expect to receive an excellent wage and benefits package. Those who become sheet metal workers have made the choice to be true achievers with a lifetime of security. SMACNA/Cleveland is proud to have recently celebrated the 40th anniversary of the Sheet Metal Promotion Plan. Site designed and maintained by Marxware Computing Services.